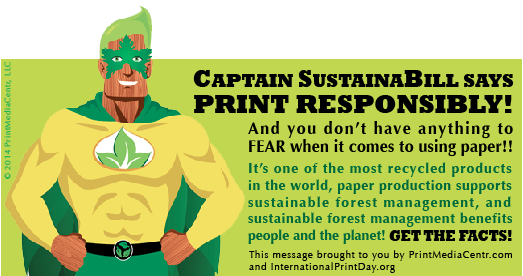 Captain SustainaBill Wants to Help You On International Print Day! 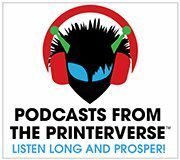 Greetings Citizens of the Printerverse! International Print Day is finally upon us and Wednesday October 8th is going to be an EPIC day of open knowledge sharing through social media around the world! To help get you started, I created the message below for you to download and attach in your email signature and share with your contacts. Tree Man finally has a name – Captain SustainaBill! – thanks to all of you out there with amazing and creative suggestions! Let’s use #IPD14 to help spread the good word on print and paper as well as the amazing work we are creating, and the products and services we need to get it all done. While my preference is TwoSides for their content and international representation, there are many resources out there providing FACTS that must be shared until the demonization of paper and print is behind us. Please take a few minutes on Wednesday to share information that makes a big picture difference for our industry. PRINT LONG – RECYCLE – AND PROSPER!!!! Contribute information, share, RT and follow all the action on October 8th with #IPD14 across all social platforms! Connect with @IntPrintDay and all the international #IPD14 social accounts here!